Another highly requested product. 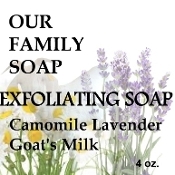 Our goat's milk soap with the addition of extra fine pumice to gently clean and exfoliate your skin. Scented with a refreshing Camomile Lavender blend. Caution: do not scrub or harshly rub your skin with this as this may cause damage. Gently wash you skin with lather and rinse. Olive oil, coconut oil, palm oil, goat's milk, extra fine pumice camomile lavender eo blend, shea butter, and Vitamin E.